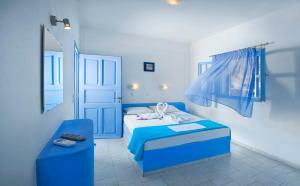 The Amelie Hotel is located just 150 meters from the famous Perissa beach in Santorini. It has a pool and a bar next to the pool. Decorated in shades of blue, this room features air conditioning, a built-in bed, satellite TV and a private balcony.